A late-night encounter with a thin and hungry polar bear in the northern Quebec community of Ivujivik in early March was a nightmare-inspiring event. Reported this morning by NunatsiaqOnline (Nunavik community receives some unwelcome guests, 28 March 2017), the thwarted polar bear attack at the edge of Hudson Bay was the fourth defense kill this year (and the second this month) after a large number of bear sightings by residents this winter. In contrast to reports of other encounters this winter that involved unusually fat bears for this time of year, this bear was thin and obviously dangerous. Sea ice development over Hudson Bay, Hudson Strait, and Davis Strait has been rather unusual this year but what that might mean for polar bears over the coming winter and spring is hard to tell. Note: The Canadian Ice Service seems to be in the process of updating its sea ice page and graphing features that used to be available weekly on Thursday have not been available until the following week. This means the most recent graphs available are for the week of 11 December (see below). According to reports from folks on the ground in Western Hudson Bay, most polar bears were out on the ice resuming seal hunting by the 20th or 21st November at the latest (some got started quite a bit earlier). That’s less than 2 weeks later than the average date in the 1980s (which was November 8). However, the rather odd pattern of freeze-up this year may not be good news for any killer whales still remaining in Hudson Bay – their access to the open ocean is already virtually blocked by ice. UPDATE 26 November 2015: What a difference a day makes! Look at the spectacular ice development overnight along the west coast of Hudson Bay and in the central portion of the bay since yesterday (below). Not much change in sea ice coverage since last week – most of Hudson Bay is still covered with concentrated ice, which is good news for Western and Southern Hudson Bay polar bears. They are still free to roam and hunt over most of the ice-covered bay. There may be slightly less ice than average for this time of year (Fig. 1, below) but coverage is still >70% with concentrated ice and does not appear to be melting quickly (see charts above and Fig. 2, below). The dates for three previous earliest breakups according to Lunn and colleagues (Fig. 3) have come and gone, as all were in the first week of June (more on that in an upcoming post) – no records broken. More graphs and maps below, see previous posts here and here. Posted on May 26, 2015 | Comments Off on Hudson Bay sea ice coverage is atypical this year but what does that mean for polar bears? 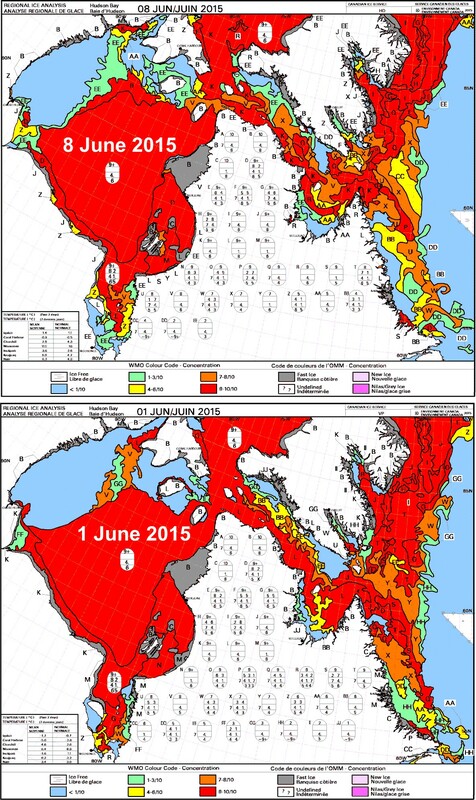 There is a rather large patch of open water in the northwest sector but what’s also unusual about breakup this year is the virtual lack of open water in eastern Hudson Bay – that almost never happens (compare to 2013 here). In addition, there’s still very little open water in Hudson Strait, which connects Hudson Bay to Davis Strait in the east – that’s also unusual. Figure 1. Sea ice extent over Hudson Bay and Hudson Strait at 26 May 2015. Canadian Ice Service. Click to enlarge. The question is: does the somewhat unusual pattern of ice cover at this date – which developed rapidly over the last few weeks – suggest we can predict whether polar bears will have a shorter-than-average hunting season? To answer that, you have to look at maps generated by the same source over several years. The result, in my opinion, is inconclusive – while so far, this year looks a bit more like 2009 (which was a very late sea ice breakup year) than it does 2011 (which was an early breakup year), it’s really too early to tell. I suggest we simply won’t know for another month or so which pattern will prevail. However, that hasn’t stopped IUCN Polar Bear Specialist Group member Andrew Derocher (via Twitter, e.g., here and here, among many others) from suggesting that this year’s pattern is likely a portend of doom for Hudson Bay polar bears. See what you think. Comments Off on Hudson Bay sea ice coverage is atypical this year but what does that mean for polar bears? I wrote about this issue in January (January – and journalists are still pushing it). Figure 1. Courtesy NY Times, Sept. 22 2014. Click to enlarge. 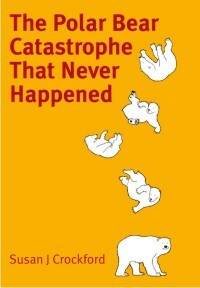 This month, the New York Times (September 22, 2014 James Gorman, “For Polar Bears, a Climate Change Twist”) is pushing it big-time (and so it’s been picked up elsewhere, like by the Anchorage Daily News). Myths and misinformation about this phenomenon dispelled below. UPDATE February 11, 2014. A reader (Kevin, at “Afton’s Waterfowl List”) has pointed out an error in Fig. 3, where I inadvertently labeled the bars on the upper graph as ending in 2011 instead of 2012 (the Pembroke graph ends at 2011. sigh..). I have corrected the figure and the text that refers to it, but do not believe it affects the overall conclusion. See for yourself. Thanks Kevin — and Alan for getting in touch! 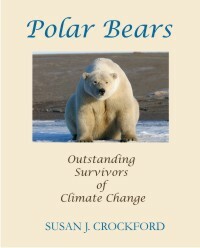 Another round of press release inspired news stories emerged last week insisting that polar bear predation on ground-nesting birds during the summer ice-free period is evidence that they are nutritionally stressed by global warming. A few weeks ago it was snow goose eggs in Western Hudson Bay – this time it’s thick-billed murre (Uria lomvia) and common eider (Somateria mollissima) eggs in Foxe Basin and Hudson Strait (e.g. see the story at Canada’s National Post and a short summary provided by Science [and it’s not even their paper!]). The source of the media attention this time is a newly-published paper by Samuel Iverson and colleagues (Iverson et al. 2014). Figure 1. From Iverson et al. 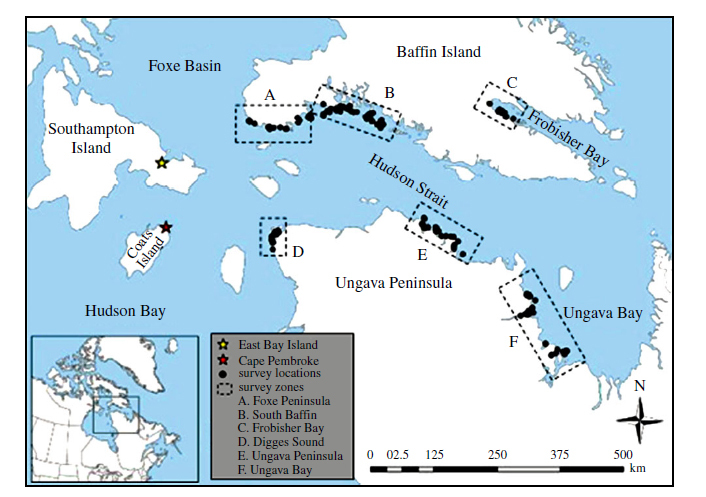 2014 (their Fig.1), “map of the study area.” Most of the study sites are within the Foxe Basin polar bear subpopulation region (see Fig. 2 below), although the Ungava Peninsula (E), Ungava Bay (F) and Frobisher Bay (C) sites are in the Davis Strait subpopulation. 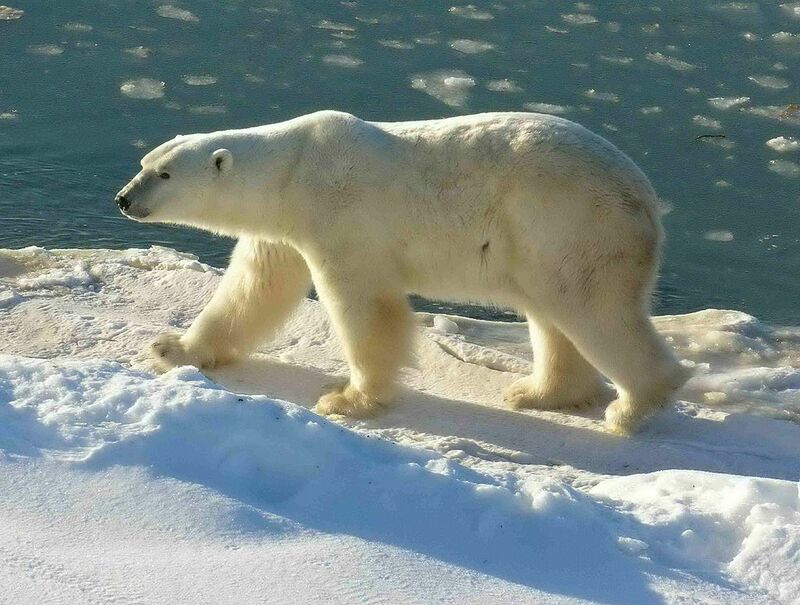 Polar bears have always preyed on ground-nesting sea bird and goose eggs while onshore (see Kelsey Eliasson’s take on the situation around Churchill, at his PolarBearAlley blog). The issue in this case is whether the increase in predation can be unquestionably blamed on reduced sea ice cover and nutritionally-stressed bears – that is, predation increases that correlate with year-to-year sea ice changes and bears in poor condition found consuming bird eggs. As I did for the “polar bears eat more caribou and snow geese than they used to” press release, I refused to take the PR or the news stories at face value and went to the published paper and its supplemental data (it’s open access, see it for yourself here). What I see in this paper is a spurious sea ice correlation and no data on the condition of the few bears observed consuming eggs. 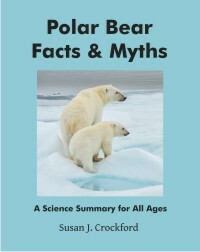 There is also no mention of the fact that polar bear numbers have increased in part of the study area (Davis Strait) or that bears in Foxe Basin and southern Davis Strait have been found to be in very good condition and reproducing well (Rode et al. 2014; Peacock et al. 2013). See my analysis below and judge for yourself.